Click on the links above the photos if you’d like to see either of the step-by-steps! Thanks so much for partyin’ with me again this year, and I hope you have fun looking through some (or all!) of the links this week! Both of your crafts are super cute and easily completed! Thanks for hosting this party! 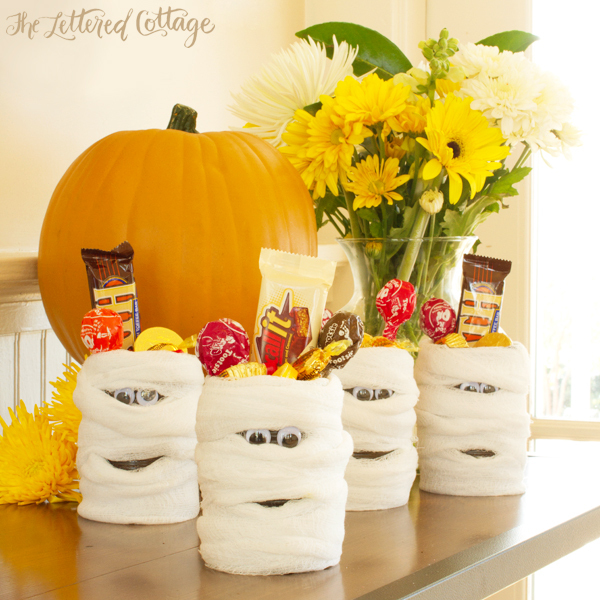 What a cute idea to make the Mummy cans as party favors! They’re adorable. I also love your tablescape. Thank you for the step by step instructions! Thanks for hosting this link party too! I know I’ll see many great Fall crafts! Thanks for hosting such a fun party, Layla! My boys would love your mummified tin cans. They are adorable! So my ‘Twine & Pearl’ craft is actually wearable. We’ve all been so busy decorating our houses, now it’s time to make something for ourselves! Thanks for the great party, I look forward to it every year. 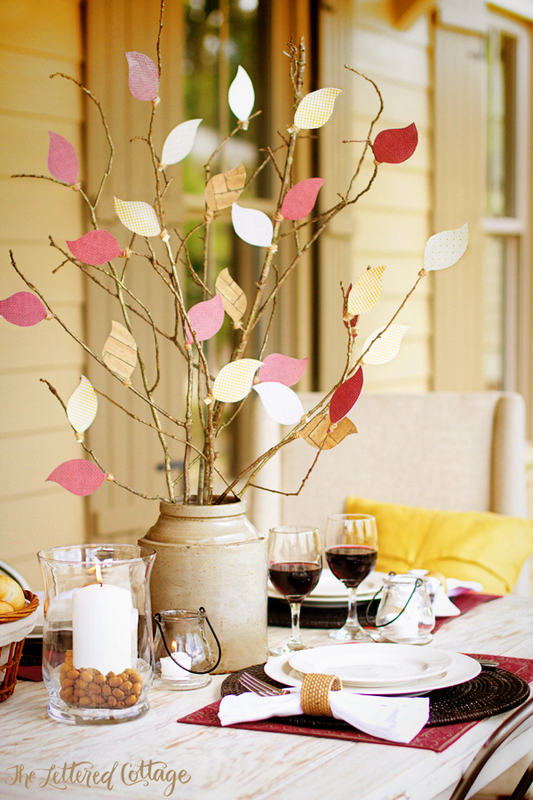 Thanks so much for hosting this super fun fall party! Looking forward to looking through all the inspiration! Have a wonderful week. Oh, I love the faux-ilage! Thanks so much for hosting. Can’t wait to be inspired. I really love your fall leaf centerpiece! I’m inspired to try it myself! Thank you for hosting this fun party! I absolutely adore those mummified cans~ too cute! Thank you so very much for hosting. Love the simple craft ideas. Thanks so much for hosting! Oh, those Halloween tins are adorable! Makes me wish we celebrated Halloween. Thanks for the party and for the opportunity to link up my Fall wreath. Those mummy cans are absolutely adorable!! What a cute idea!! I might have to make those for our neighbors kids this year 🙂 First time linking up with you, thanks for hosting! Love your faux-liage idea! The leaves don’t change color in Houston until December and I miss being able to bring them into the house. Now I can make my own Fall color! Your projects are fabulous! Thank you for the fun party! Love those mummified cans! You can’t ever go wrong with googly eyes. All I can think of is that ridiculous skit on Saturday Night Live with Christopher Walken and all the plants with googly eyes – too funny! Thank you for hosting this party. I love Fall inspirations! Thanks for hosting Layla, love those cute mummy cans. Both projects are really great. Beautiful ideas my friend, and so simple! I’ll be linking up later today with my little ol’ project, happy fall ! Thank you for doing these holiday linky parties. I love all the ideas I’m able to get from them. Plus this go around I actually get to participate since I started my blog! Hope you can click over and check it out. I’ve linked back to you on a few posts I’ve done. I will see in October at the chapel because we are making the trek from TX to AL! Making that our anniversary trip! Such a fun collection of ideas! Thanks for hosting! Thanks for hosting the wonderful party. I saw your mummy craft on the HGTV site. So cute!! I’ve also been following your adoption story and I hope the rest of the process goes really smoothly for you and Kevin. I know that there will be blessings all around when your baby arrives 🙂 Happy Fall. Thanks so much for hosting Layla!! Hope you have a great weekend!! Fun linky party! Thanks for hosting. So many ideas……so little time…..but I love it! 🙂 Thank you for hosting this fun party! Thanks for doing this. My boys and I are doing this craft this weekend! I think we’ll make them, stuff them with candy and take them to a few of the elderly people in our neighborhood! Love all of the ideas and your blog as a whole. Big Fan!